Really, it was. Very stormy. Those continentals do thunderstorms extremely well. Lightning, thunder, rain, power cuts. A few more clothes than normal went on and we rolled the 20km out of town, over the border... into Belgium. At least, aspects were Belgian. The chill. The moisture. The combination of mist, fog and drizzle that morphed into clouds as we climbed higher. 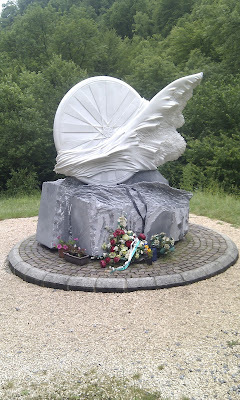 Obviously the climbs weren't particularly Belgian, but I guess they must have had some kind of cataclysm, throwing up some mountains overnight. 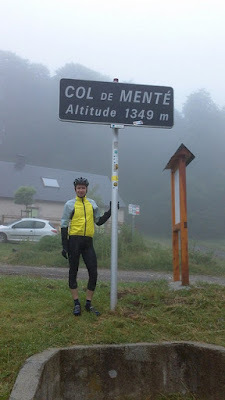 The first col of the day was Col De Mente - 9.3 km long, 849 up (an average percentage of 9.1%) with bits in excess of 11%. I noticed that our reigning King of the Mountains was having an easy day so this was the time.... to attack. Up ahead, big Iain. Big as in tall, strong, powerful... but heavier than me. He'd also spotted the chance to take a Col and had set off at a fair old pace. I kept him just about in sight, through the trees, around the hairpins. It was certainly a cooler day - I guess both of us liked this kind of weather. Slowly, slowly I started to catch up - I knew there was a fair way to go so there was no hurry. Occasionally he looked round. Did he speed up as he saw me? I my mind, yes. In reality, probably yes. Then the van came past, with Dangerous Dave at the wheel. Now, Dangerous Dave had a habit of goading riders. He might call it encouraging, we called it goading. He leaned out the window... "You're not going to let him take this one are you?". "I'm just taking my time... few k to go". He passed me, and slowed as he drew alongside Iain. Whilst I couldn't hear him I could imagine the conversation. "He's catching you! Don't let him catch you! You've got this one!". I closed in, and sat on his wheel for a few seconds. I'm sure I heard a comment at that point, but it could have been the wind. I attacked, getting a 10m gap. I eased off, to let him catch up. I attacked again, with a slight giggle. There was definitely a comment that time. The rest of the climb involved me trying to keep the gap safe, and presumably Iain try to close up. He was quicker on the flatter bits, I had the advantage on the steep bits. Gradually I pulled away. The Col was mine. Not by much, but it was mine. He's a picture of me looking like a muppet. Go on, laugh. I don't care. At the top, DD was waiting with hot drinks. We needed them. Soon Iain and I were joined by others, and cooling rapidly three of us set off carefully down the descent. At the bottom we found ourselves at one of the most (in)famous Cols in the tour - Col de Portet D'Aspet. Short and sharp 4.4km averaging 9.6% - with a maximum of 12.5%. 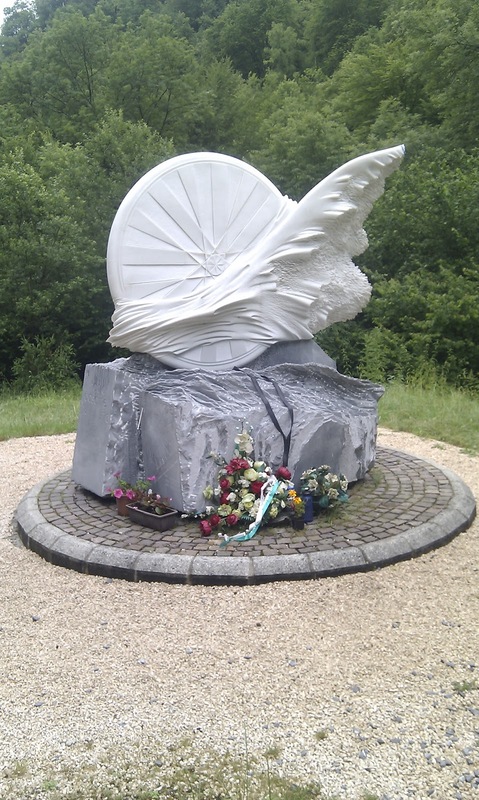 This was the descent where Fabio Casartelli crashed and died during the 1995 Tour de France, and there is an impressive memorial to him at the foot of the climb. I pulled over, had a wander, a sit, a think. Road cycling is potentially lethal in so many ways. We'd flown down narrow roads at 70kph, on 23mm of rubber, less than a metre from deadly ravines. Dodged cars. Hopped potholes. Had punctures. Slid on gravel. Protected by a piece of polystyrene and a layer of lycra. Sometimes it's good to sit and think. Just don't do it on a technical descent. My two companions missed the memorial. They thought I was going for a piss.